A funnel cloud was spotted Wednesday, June 12, over Hanover, Ill.
Tornado watches and warnings stretched over the Midwest overnight Wednesday as a massive storm system menaced the biggest cities in the region, pushing tornadoes, extraordinary winds and heavy rain — and perhaps even a derecho, an explosive wind pattern that's like a hurricane on land. 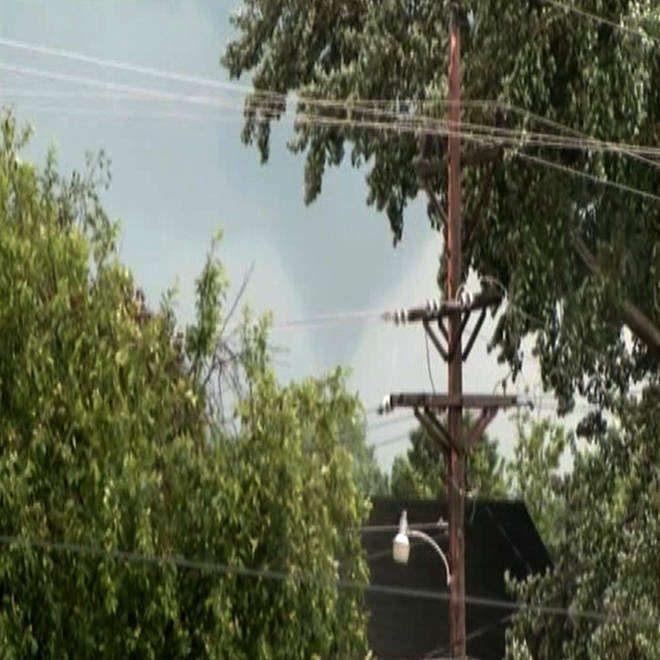 A tornado was spotted about 7 p.m. (8 p.m. ET) near Savanna in Carroll County in northwest Illinois. A county sheriff's dispatcher told NBC News there were some reports of injuries, but it was too early to have any indication of their number or severity. Officials also reported two tornadoes touched down in northern Iowa. At one point, tornado warnings — meaning a tornado had been confirmed or that conditions were such that one was imminent — were in effect simultaneously in Iowa, Illinois, Ohio and Indiana. Early Thursday, a powerful supercell system was approaching metropolitan Cleveland, carrying baseball-size hail and significant potential for a tornado, said Nick Wiltgen, a meteorologist for The Weather Channel. It was the leading edge of a storm system with almost 75 million people in its path at the beginning of what Mike Seidel, a meteorologist for The Weather Channel, said was going to be a "long and ugly night" for Chicago, Detroit, Cleveland, Indianapolis and the rest of the Midwest. About 71,000 customers were without power in parts of Indiana, Illinois and Ohio, utilities reported Wednesday night. Flash flooding was also risk throughout the region, the Weather Service warned. The Weather Channel reported "buildings destroyed" in Auglaize County as powerful winds blew through Ohio's northern Miami Valley early Thursday, though no details were immediately available. In the same county, a semi truck was toppled by high winds, NBC station WDTN TV in Dayton reported. Later Thursday, the storm is projected to blast an enormous area of the East stretching from New York south to Atlanta with damaging wind gusts and heavy rain. "This is a particularly dangerous situation," the National Weather Service said in an alert. About 75 million Americans are in the path of a severe storm system that could bring a derecho, a group of thunderstorms accompanied by severely damaging winds. Mike Seidel of The Weather Channel reports. A home in Lemont, a suburb of Chicago, burst into flames when it was struck by lightning and was still burning Wednesday night, NBC Chicago reported. In Lake Delton, Wis., a "very, very strong downpour of rain" caused the roof over a loading dock to collapse at a Wal-Mart store late Wednesday afternoon, police said. Police Sgt. William Hitchcock told NBC station WTMJ of Milwaukee that no serious injuries were reported, but the store is likely to be closed through Thursday. Forecasters said it was trickier to predict whether it would produce the little-known phenomenon of a derecho, but "conditions seem to be favorable for one this week," said Nick Wiltgen, a meteorologist for The Weather Channel. "Maybe more than one." A derecho can cause damage similar to a tornado but moves along a straighter line. (In Spanish, the term can mean "direct.") To qualify, the swath of wind damage must be 240 miles long and include wind gusts of 58 mph or higher along most of its path. 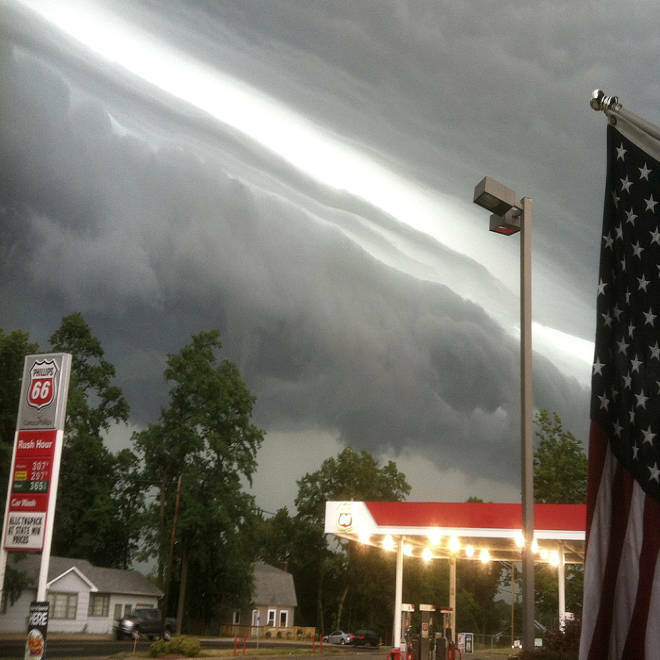 This photo, also available from a NOAA storm summary, shows the leading edge of a derecho in LaPorte, Ind., on June 29, 2012. Last June, a derecho packing wind of close to 100 mph roared from Illinois to the Mid-Atlantic, killing 13 people, causing $1 billion in damage and leaving more than 4 million people without power. That storm was followed by a heat wave that killed dozens more. In Columbus, Ohio, where that storm hit especially hard, authorities said they were better prepared after the city's 911 system was overloaded by calls last year, significantly slowing their emergency response. This year, they acted before the storm even arrived. "We have an emergency operations center ready to be activated at a moment's notice," Columbus police Sgt. Elrico Alli told NBC station WCMH. "We have extra vehicles, mobile substations, all-wheel drive vehicles — we can get in and out immediately." If a derecho does occur, it would probably last into early Thursday, said Bill Karins, a meteorologist for MSNBC. But he stressed that forecasters weren't sure. "It's like predicting a large tornado is going to happen," he said. "No one can do that. The only thing we can do is say conditions are favorable for one to happen." Catherine Cetta, Justin Kirschner and Sophia Rosenbaum of NBC News contributed to this report.